After the success of the hardback, students and academics will welcome the publication of this book in paperback. The aim of the book is to explore the connection between two perspectives that have had a profound effect upon contemporary thought: post-modernism and feminism. Through bringing together and systematically analysing the relations between these, Hekman is able to make a major intervention into current debates in social theory and philosophy. The critique of Enlightenment knowledge, she argues, is at the core of both post-modernism and feminism. Each also offers a basis for critical reflections about the other. In particular, post-modern philosophy provides a means of criticizing aspects of contemporary feminism and thus contributing to the development of a more sophisticated approach to current feminist issues. 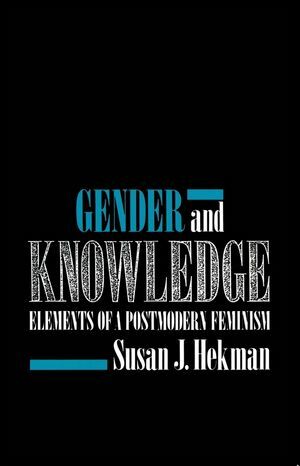 Susan Hekman was previously Visiting Associate Professor at the University of Washington. 1 Modernism, Postmodernism and Feminism. 5 The Possibilities of a Postmodern Feminism. * The hardback sold particularly well. * The book is highly topical in the current postmodernism debates addressing the relationship between postmodernism and feminism.